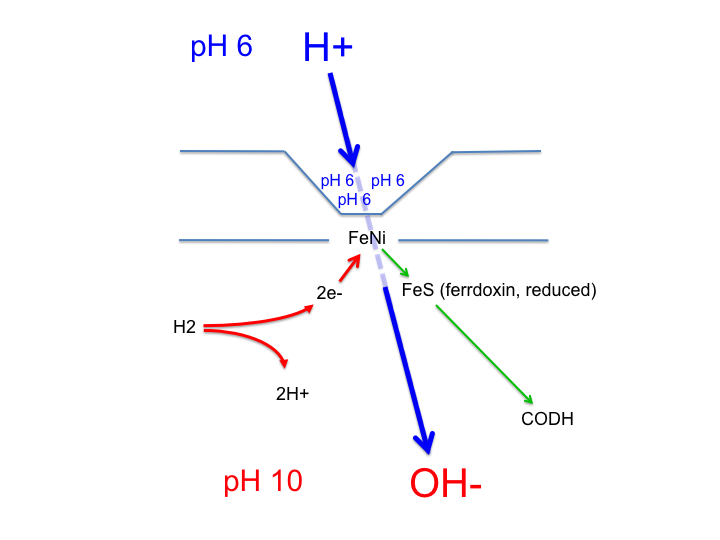 When I draw my doodles of early energetics my standard protocol is to have low pH, high H+, oceanic region at the top. The ocean is above.... I have the vent derived, geothermal, low H+ region at the bottom, that's were the rocks are. Again, for various reasons, I will refer to the blue subunit EchA as NuoL. This modern Ech is energy converting, it pumps protons through the blue anti porter homologous to NuoL. All of the arrows are now in their modern pumping direction. The pump is powered by reduced ferredoxin (from elsewhere in the cell) and produces hydrogen as waste. Typical bacteria using this Ech might be E coli, to produce flammable flatus. The source of reduced ferredoxin is any catabolic process. Fermenting starch in the anaerobic colon has predictable results in this department. An understanding of the initial role for this antiporter is crucial to any logical approach to bioenergetic evolution. Equally interesting are the adaptions of subunit EchB (homologous to NuoH) to changing the activity of NuoL from antiporting to Na+ pumping. 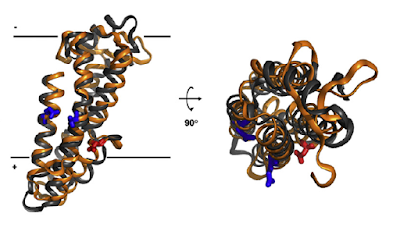 It can do this in a modern bacterium because there is a proton gradient, created by complex I (or any other energy converting complex/hydrogenase), i.e. protons are available to travel down a concentration gradient in to the cell, much as they might have done in primordial times. 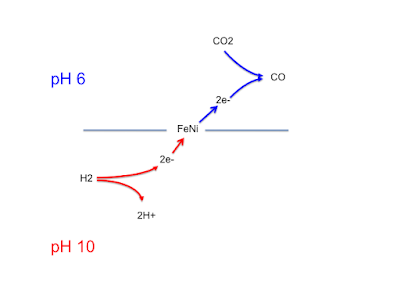 Na+ ions are forced out against a concentration gradient, in this case because this particular microbe lives in an extremely high Na+ environment. If you delete the Mrp genes for subunits MrpD and MrpA you cripple its antiporting ability. Engineering back in homologous proton translocators from a modern complex I restores the full antiporting ability.This tells us that the modern proton translocators of complex I are still antiporters but their antiporting is kept suppressed. I would suggest by NuoH. Note that the Mrp antiporting complex has no NuoH subunit. NuoL does appear to be distantly related to NuoH, possibly by very ancient gene duplication. The conservation of form can be seen in these lovely images from Marrreiro et al. The gold ribbon is NuoH and the grey one is NuoL. The channel form is clearly visible. I consider NuoH to be homologous to the original proton ion channel from my proto-Ech doodle and its relative NuoL to be homologous to a prototypical Na+/H+ antiporting derivative. I think that the initial gene duplication/modification would probably have produced an uncontrolled antiporter which would have produced a dramatic fall in intracellular Na+ concentration. This activated ATP synthase, making it function as an ATP generating rotor turned by Na+ re-entering the cell. This would generate ATP as fast as the proton gradient could produce a Na+ gradient. Very fast. Proto-Ech is essentially sidelined as a source of high energy compounds by the novel Na+ energetics system. 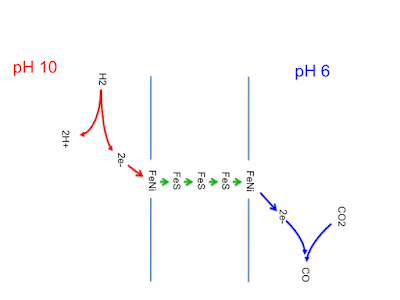 Mutations in NuoH or the NiFe hydrogenase would no longer be fatal, so there is the scope for the now redundant proto-Ech to be converted to a metabolic sensor and switch. Excess reduced ferredoxin indicates a surplus of energy supply, almost certainly driven by over zealous antiporting. If this excess reduced ferredoxin is allowed to drive through proto-Ech, pushing electrons towards the FeNi centre and beyond to reduce protons to H2, this sign of excess could easily be adapted to produce a conformational change in NuoH. NuoL is stuck on the side of NuoH. Changes in the shape of NuoH produce changes in both shape and function in NuoL. All that is needed is for excess reduced ferredoxin to produce a conformation change in NuoH and it could shut off the antiporting in NuoL. Having the antiporter (NuoL) glued to the side of NuoH allows the switch to function effectively. Summary so far: Excess reduced ferredoxin stops/reduces antiporting and so controls ATP over-synthesis derived from exuberant Na+ energetics. So here is the next question: What happens when the geothermal proton gradient fails? For a start, the free lunch from antiporting disappears. We still have the back up of ferredoxin energetics from electron bifurcation but nothing to compare to the glut of ATP from the now diminishing Na+ energetics. What is needed is some way of pumping Na+ out of the cell which could replace the simple and exceedingly easy antiporting system. I've already got reduced ferredoxin acting through redundant proto-Ech as a brake on antiporting, as part of a control system on Na+ energetics. 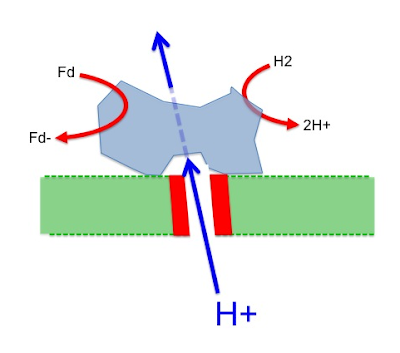 If we were to generate a change with allowed us to "over-apply" the ferredoxin brake we could, plausibly, go so far as to do more than simply stopping Na+ entering the cell, we might actually start to reverse Na+ ion flow and pump it outwards. Na+ pumping by using the energy derived from reduced ferredoxin. Proto-Ech is now running in reverse and pumping Na+ ions. It is conserving energy as a Na+ gradient and so is now a true Ech, there no longer anything "proto" about it. It's reversible. Na+ energetics are restored and the core power supply to the cell is electron bifurcation supplying power to drive Na+ energetics. That's how it stays until cytochromes come along. 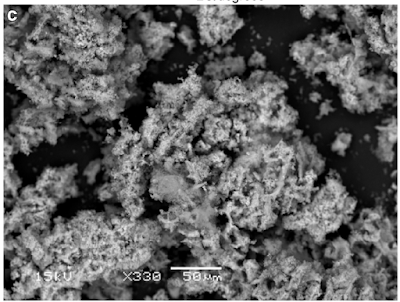 Let's begin with electron micrographs of the structure of the precipitates in Nick Lane's hydrothermal vent simulating bench top reactor. I've sketched what I think might be happening within the latticework of these amorphous precipitates. As the fluids mix it's not simply linear. There will be channels, eddies and incomplete barriers. We know because the CO goes on to reduce to formate and Nick Lane picked this up in respectable amounts from the fluids flowing through the structures shown in the electron micrographs. The hydrogenase is core to Ech but we need another step to get us from a hydrogenase using the pH gradient to a true proto-Ech. 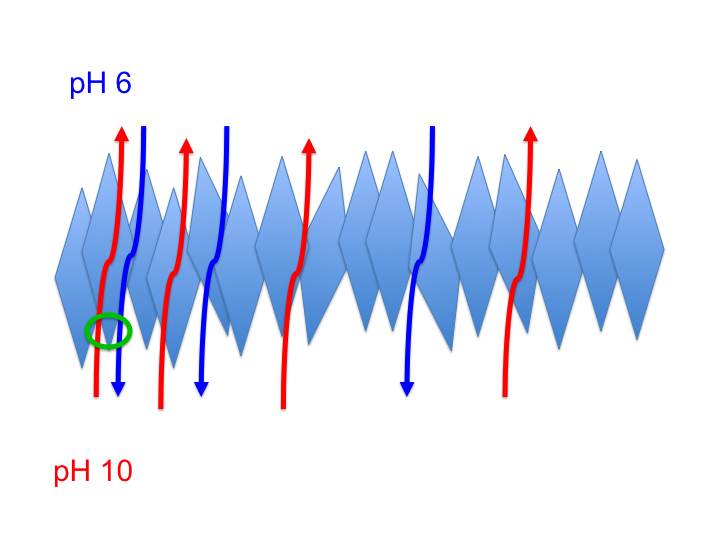 That step is the formation of a protomembrane. The protomembrane is freely conductive to both protons and hydroxyl ions but will stop the FeNi hydrogenase getting close enough to the inorganic cell wall structure to get a decent look at a pH of 6, needed get ferredoxin reduced. 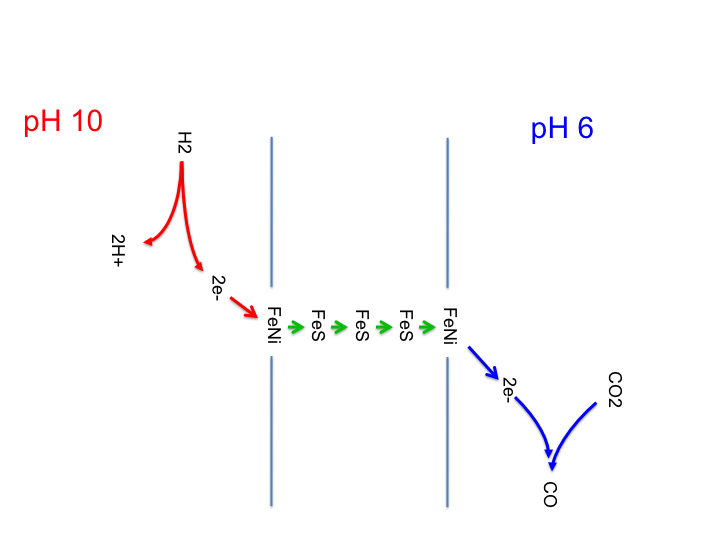 I think it is a reasonable assumption, if this thought train is correct, that there is no way that a gradient of Na+ ions can replace a gradient of H+ ions, you simply wouldn't get the pH 6 within the enzyme by translocating Na+ ions. 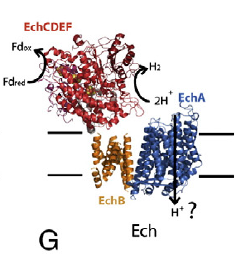 The modern Ech has a second membrane protein built in to its structure, an anti porter. That will transport Na+ ions, and is reversible. PS, for Passthecream: One way H+ but no Demon in the channel! There is a proton gradient, FeNi catalysis, activated acetate, ATP (via SLP), no membrane. 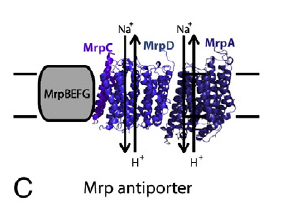 Antiporter invented while membrane still proton permeable but Na+ opaque. Antiporter provides a Na+ gradient in addition to the H+ gradient, this helps because Na+ (along with H+) can drive ATP synthase to produce ATP and Na+ (along with H+) can drive Ech (TVQ p144, line 10 and line 23) to produce reduced ferredoxin. 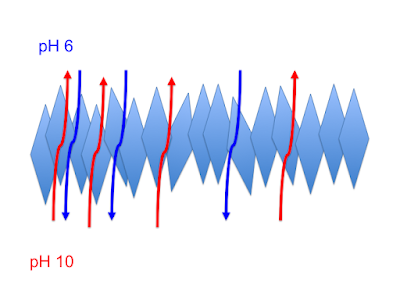 This is a pre adaptation to proton pumping, because a pumped proton drives the antiporter which maintains the Na+ gradient whenever the natural proton gradient of the vents diminishes. i.e. with an antiporter plus pumped protons a much smaller vent gradient is needed. 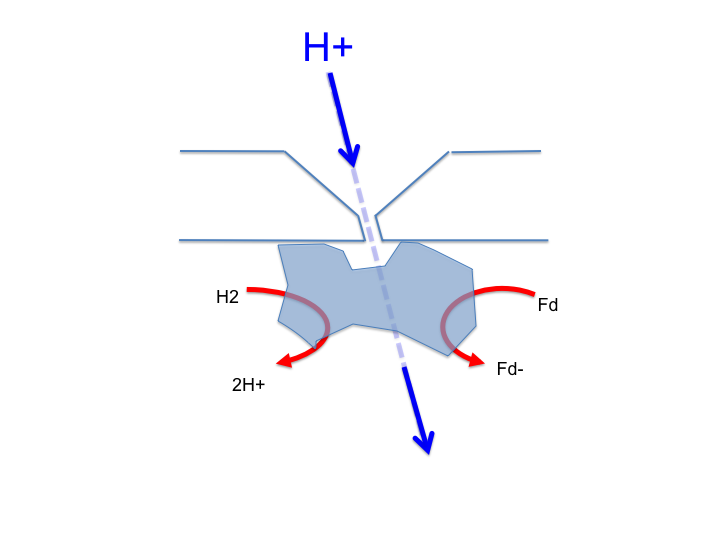 A proton pump is developed, not specified where from but probably from Ech/antiporter. 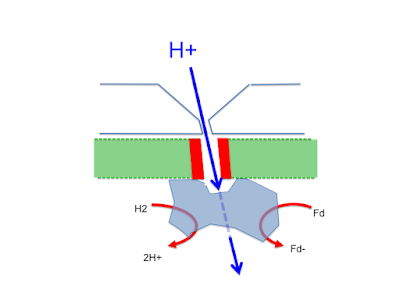 Membrane progressively tightens to H+ and so Na+ pumping becomes progressively less important, it’s pumped protons which now return through ATP synthase. No longer any benefit from Na+ pumping so everything uses pumped protons and these are pumped via Ech using reduced Fd- from electron bifurcation (acetogens) or via a modified anti porter powered by methylene-H4MPT (methanogens). As I have commented before, I have trouble with the very early development of ATP synthase as a very complex nano machine providing ATP for a cell in the earliest periods of crude membrane formation. 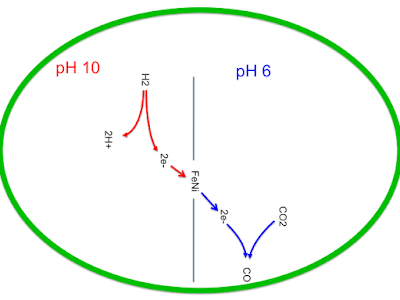 However, that does leave Ech, energy converting hydrogenase. The next few posts are on Ech but for now it is a primordial supplier of reduced ferredoxin to the protocell. It is very simple and works perfectly well on the primordial proton gradient. However, having rejected ATP synthase I am left with the problem of ascribing the benefits of Na+ antiporting to the use of Na+ energetics by the developing Ech, this won't work. Ech, as a generator of reduced ferredoxin, is dependent on the pH gradient provided by the vents. 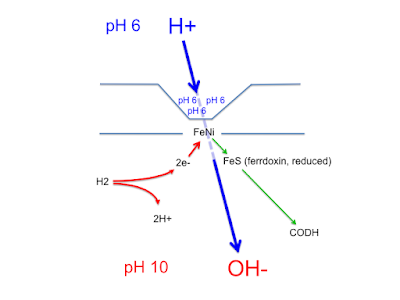 It's a matter of redox potentials for H2 converting to 2H+ and 2e-. See next post, you can't do this with a Na+ gradient. Permeable membrane develops. 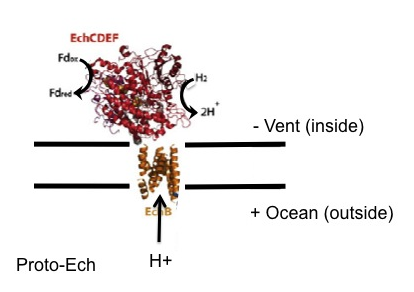 This forces proto-Ech to develop as a protein encrusted FeNi enzyme, it runs on vent gradient to generate Fd- to generate activated acetate and ATP (still via SLP). Any membrane forces the development of an ATP driven translocase to allow spread of RNA/proteins through vents through membrane barriers. The translocase jams and ends up using ATP to pump Na+ ions rather than to translocate a protein. Modestly lowered intracellular Na+ improves proto-Ech function. The antiporter causes a marked drop in intracellular Na+ which forces the translocase-derived Na+ pump to flip in to reverse and so generate ATP from the suddenly hugely increased Na+ gradient. This is the origin of ATP synthase. To leave the vents proto-Ech is adapted as a power supply to the antiporter (so that H+ gradient driven antiporting is no longer needed), becomes the true Ech at this stage. It always pumps Na+ outwards using Fd- from electron bifurcation either directly or indirectly via methylene-H4MPT. Everything runs on Na+ energetics, there is no rush to generate a proton tight membrane, but no problem if/when it happens. Cytochromes demand H+ energetics, most organisms convert to cytochromes at various different evolutionary times. Non-cytochrome microbes continue to run on Na+, even today. The problems in this timeline, also in red, are the benefits to a protocell from lowered Na+, the limitation of Ech to pumping Na+ only, certainly until much latter and the evolution of cytochromes, and the idea that Methyltransferase, which pumps Na+ in methanogens, is a derivative of Ech. These are the subjects of my next couple of posts, along with where Ech came from and why it must have a proton gradient. EDIT Methyltransferase is much more complex than an Ech derivative! What's wrong with Na+ ions? "Could you please expand on why you *think* Nick Lane might think what he does here?" "[...] he seems wedded to proton translocation as being physically related to ferredoxin reduction, which I doubt is needed. It's not a "reduced FeS synthase-like" machine, as far as I can see. 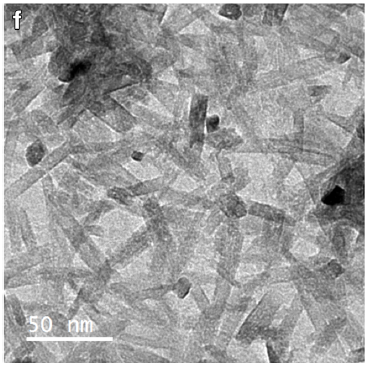 The generation of formate under simulated vent conditions needs nothing other than a completely randomly structured amorphous Fe/NiS matrix, nothing cell-like or translocating is required for this aspect in Lane's bench top reactor." There are two aspects to this. One is the specificity of early life for protons, i.e. do we have to have a gradient of protons, and the other is what sort of process is involved in the generation of the thioester which is the precursor of acetyl CoA. Is there an "FeS-synthase" machine? This current post is about the Na+ gradient aspect. “The alert reader may be wondering why the cells don't just pump Na+? Indeed it is better to pump Na+ across a leaky membrane than to pump H+, but as the membrane becomes less permeable, that advantage is lost. The reason is esoteric. 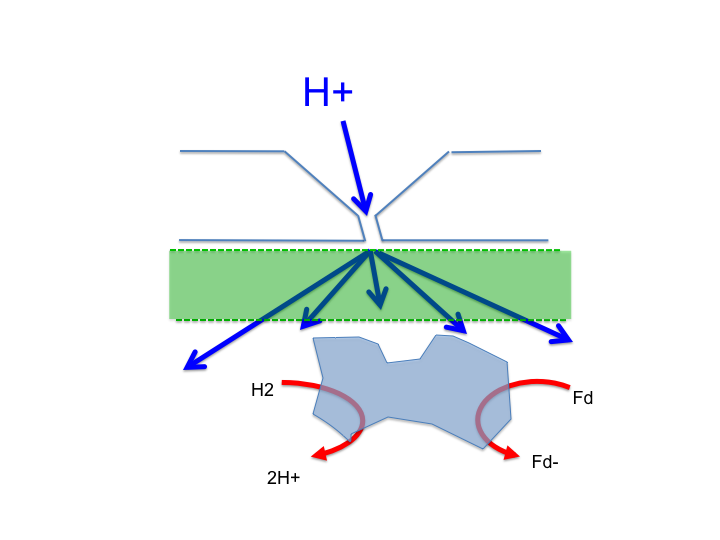 The power available to a cell depends on the concentration difference between the two sides of the membrane, not on the absolute concentration of ions. 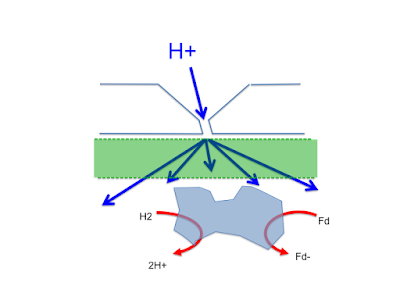 Because Na+ concentration is so high in the oceans, to maintain an equivalent three orders of magnitude difference between the inside and outside of the cell requires pumping a lot more Na+ than H+, undermining the advantage of pumping Na+ if the membrane is relatively impermeable to both ions”. I have a lot of problems with this standpoint. First is that you are not trying to increase the extra cellular Na+. A few extra Na+ ions in the ocean, perhaps already at a sodium ion concentration of 450mmol/l in the region of a protocell, are hardly going to change the Na+ concentration around that protocell. I would regard the primordial extra cellular Na+ concentration as fixed. What you actually have to do is to drop the intra cellular Na+ concentration to 1/1000th the ocean concentration and you would then get those three orders of magnitude in to the gradient. Somewhere just under 0.5mmol/l within a cell versus an ocean at 450mmol/l outside the cell would do this. This leads directly to the second problem I see. This is the concept that you might remotely need a 10^3 Na+ gradient. The function of the 10^3 proton gradient provided by the vents, in the beginning and in Nick Lane’s reactor, is to provide FeS at a redox potential to reduce CO2 to CO using H2. That needs a big proton gradient. Pumping Na+ ions is completely different. No one is talking about reducing FeS using Na+ ions. All the Na+ gradient is doing is trying to store energetic loose change to make a few ATP molecules. This does not need a 10^3 Na+ gradient. Acetobacterium woodii will grow with an extracellular Na+ concentration of about 50mmol/l, well below the speculated 450mmol/l of the primordial ocean. There is no way A woodii can generate a 10^3 Na+ gradient with 50mmol/l extracellular Na+ and A woodii grows quite nicely on very modest Na+ energetics. These energetics are completely dependent on an ATP synthase driven by a gradient of Na+ ions but this doesn't need a 10^3 Na+ gradient. My third problem is that all of this only applies once ATP synthase becomes active as a synthase. 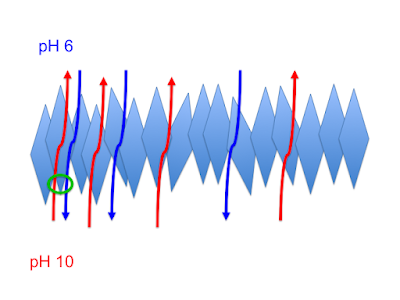 I can't visualise a complex rotator stator evolving to run on a primordial H+ gradient. While both the pore-like structure and the ATP consuming helicase component appear to be very highly conserved across the archaea-bacterial divide, the method of joining these two common subunits together to form an ATP synthase is certainly not conserved. My conclusion from this is that while the precursor of ATP synthase was a component of LUCA, ATP synthase itself was not. If ATP synthase is not primordial there is no specific need for it to be running off of the primordial proton gradient. I described Koonin's idea that ATP synthase develop from a translocase in a previous post. If we accept Koonin's concept as correct about the pore/helicase scenario and the functional role of Na+ ions in stabilising the pore structure, this naturally leads to the expulsion of Na+ ions from the cell without any clear cut benefit other than lowering the intracellular Na+ concentration. I initially had no idea what the the benefit of a low intracellular Na+ concentration might be. Obviously ATP synthase would not be retained as a pump of Na+ ions unless there was some immediate benefit to the cell. Now I might have found a potential benefit to lowering intracellular Na+ which applies to the primordial generation of acetyl thioester which is core to substrate level phosphorylation at the start of life and has direct relevance to the use of the proton gradient. The more I think about it the more it seems likely that there actually was a molecular machine running off of the proton gradient soon after the start of "life". But I do not think it was anything like ATP synthase, i.e. there are no molecular mechanics, no protons pushing bits of protein around in the way protons do in a modern ATP synthase. How it all came together is an interesting area to speculate on. Perhaps in the next post. Labels: Life (06) What's wrong with sodium ions?